Come celebrate Halloween with us at Yough Lake Campground! We will be hosting Trunk of Treats at Yough Lake Campground on Saturday, October 6th! Campers interested in participating are encouraged to decorate their campsites in Halloween or autumn theme. 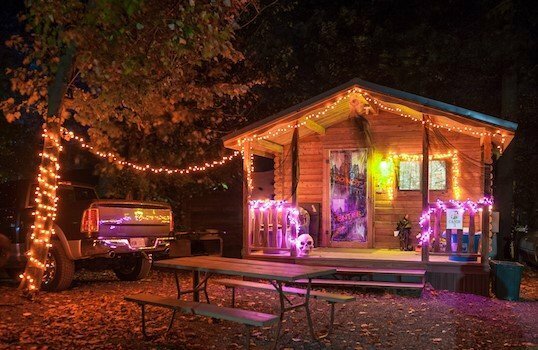 Pack up your favorite Halloween decorations to spook-ify your cabin, RV site, or tent site! And don’t forget to bring your candy or Trick or Treat bags. All registered campers are welcome to dress up and participate in Trick or Treating starting at 5:00pm. And the best decorated campsite will win a frightfully delightful prize. Don’t forget the Pumpkin Fest in Confluence starts Friday October 5th! Confluence Pumpkin Fest features arts and crafts, food vendors, entertainment, a 5k run/walk, and more. Admission is free! And there are lots of fun events planned over the course of the weekend. And save 15% off your reservations for camping with our Celebrate Fall discount! Just us promo code CFSO when making your reservations. ← Don’t Miss Fall Fun and Savings in Ohiopyle!